What's happening to our conker trees? 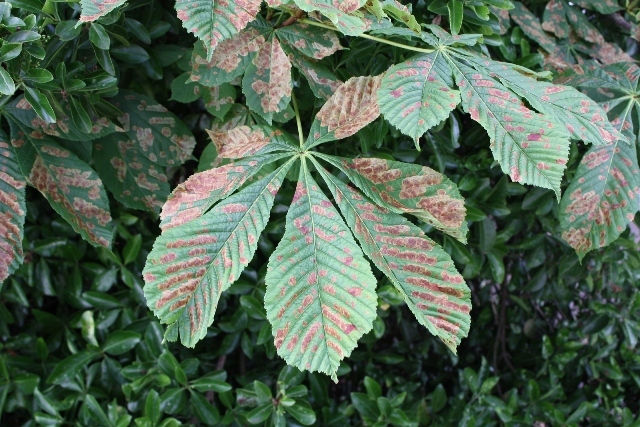 Have you noticed whitish patches on the leaves of horse chestnut trees? By the middle of summer, the whitish patches die and turn brown. Sometimes whole trees turn brown, and it looks like autumn has come early. Our conker trees are under attack by 'alien' invaders! 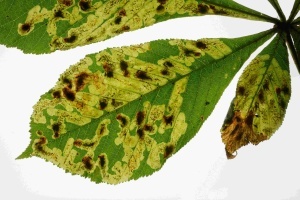 The damage is caused by a tiny 'alien' species of leaf-mining moth, which is invading the UK. For biologists, an 'alien' is a species not naturally found in an area or habitat. The moth’s caterpillars eat the leaves from the inside. Infected trees are weakened, and produce smaller conkers. Fortunately, there may be help at hand. 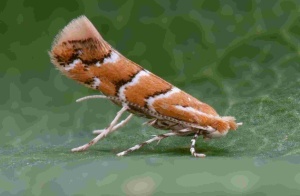 Some of the leaf-mining moths are killed by birds that prey upon the caterpillars. Others are killed by natural pest controllers, in the form of tiny insects. These insects lay their eggs inside the caterpillars of the leaf-mining moths, and when the eggs hatch, the larvae slowly eat the caterpillars, eventually killing them. From 2010 we have been inviting people to take part in real science to discover more about conker tree health by taking part in our missions. From 2014 we have set up a recording page for the leaf-miner, and have set up the missions as stand-alone activities, ideal for school children. Get invovled in real science! The Conker Tree Science project is real science: the frst scientific results of the Conker Tree Science project were published in the scientific journal PLOS ONE. Find out about the results. Find out more about how to take part.